In this Kitchen Nightmares episode, Chef Gordon Ramsay visits Campania in Fairlawn, New Jersey bought by Joseph Cerniglia only 18 months ago but it is already close to closing. Gordon arrives to meet Joe and the staff are goofing around in the kitchen. Gordon orders the tortellini soup, ravioli and pistachio and cranberry crusted chicken. The soup is bland and tasteless with bought in tortellini, the ravioli is covered in sauce filled with garlic and the chicken is dry and sweet. Gordon inspects the fridges and is surprised to find that the fridges are stocked full of food but with customer numbers low, they are wasting money. Gordon arrives to witness a dinner service and realises that the staff are acting like the restaurant is a high school and the restaurant is overstaffed. Gordon asks Joe to make his first change, which is to send home some wait staff. The customers are left in the dining room waiting for food with one customer resorting to ordering a pizza! When the guests receive their food, the huge portion sizes mean that most of the guests leave with leftovers. The next day, Gordon meets with Joe's wife and she tells him that if the restaurant fails that they will lose their house. Gordon introduces a signature dish of meatballs and they head out into town to promote "New Jersey's Best Meatballs" with samples and flyers. Joe confides that he is in $200,000 of debt and Gordon tells him that he needs to start taking the business seriously. Overnight the restaurant is given a makeover, complete with a brand new oven and smaller plates, as well as a revamped menu with smaller portions and the signature meatballs. To motivate the staff and challenge the kitchen they play a game of "server bingo" with the first server to sell everything on the menu winning $100. On relaunch night, the restaurant is packed and the food leaves the kitchen at a good pace. A customer finds her steak "tough" and complains, Gordon sees that there is nothing wrong with the food and tells her to stop causing trouble, he tells other customers to ignore the old bat. Joe feels the pressure and the orders back up. Another customer says that her pasta tasted like Ragu causing a fight in the parking lot. Gordon gives Joe a pep talk about being strong and not letting the complaints affect him. Joe pulls it back for a successful finish to the service with a more serious attitude. The team is pulled together for a pep talk and as a final parting task, they smash all the old plates. Joe won Chef Central's Bergen County Ultimate Chef Competition in 2008 and came Runner Up in 2009. Yelp reviews after filming were very mixed. In September 2010 Joe sold the restaurant to Campania Holding Corp and 8 days later committed suicide by jumping off the George Washington Bridge into the Hudson river. It also appears he was in a relationship with Jessica. Campania closed in January 2011 and Sage Restaurant, an American/Italian restaurant opened in it's place on 29th March 2012 with mostly positive Yelp reviews. Campania aired on November 28 2007, the episode was filmed in March 2007 and is Kitchen Nightmares season 1 episode 9. It seemed obvious during the show that he was sleeping with at least one waitress... didn't it?!? yes it did. there's at one point when he touches her shoulders on the camera in the episode found on netflix. Im now getting to see these old episodes and sad to hear this is what happened. I had been watching the older episodes of Kitchen Nightmares and while learning of the affair didn't blow my mind, it really struck me when I heard he died. I know that there are likely some contrivances, etc. but I like to think some people are truly helped by Gordon and the show. It is truly terrible that this happened, Joe seemed to be a talented chef and well-meaning guy. It is so unfortunate that things went so far downhill for him emotionally. Just watched the episode and came here to read what happened next. As far as cheating, unsurprised ... I thought of that possibility while watching the episode. The suicide thing was a big surprise. Just watched here in Brazil. I was very saddened by this news. Posting this in July, 2014 - My husband and I just finished watching this 2007 episode. As the credits rolled, I logged on to my laptop to check out the Kitchen Nightmares Updates sites I have bookmarked I wanted to see if there have been any updates since the initial airing or if the restaurant had since closed. "Updates", indeed. I was floored to see that Joe had committed suicide. Why in the heck is this episode still being aired?? I saw a couple of mentions in the comments above that BBC America doesn't show this episode anymore, which explains why we had never before seen it; tonight, however, we happened to catch Kitchen Nightmares reruns on the Bio cable channel (which will change over to its new branding as the "FYI" cable network in about 1/2 hour). Then to see in a couple of the linked articles that the mother of his mistress had agreed to be interviewed by the media ... and to read how she had wailed about how "heartbroken" her daughter was at his death, and how in love the daughter and Joe had been ... seriously?? What an utter lack of class and compassion! And how were his parents, his wife, and his kids supposed to feel if they read that? My belated condolences to Joe's family - I hope that they are doing okay, and that they have been able to piece their lives back together as much as possible. The three kids were adorable, and the wife seemed like a kind person who truly cared about her family. I really hope that none of them happened to be watching Bio/FYI tonight. RIP, Joe. I came here to talk about the old woman/family who were fishing for a free meal and a chance to be on tv and Gordon called her an old bag but it was clear as day he was sleepin with Jessica hell the show opened with her giggling and smiling and playing with him in the kitchen. Hope his wife had a great insurance policy and her and their kid are taken care of is all I have to say about the rest of it. Its sad that he took his own life, I dont care about the affairs he maby had, I do hope that the kids and their mom are okay and maby have some support from Ramsey and the others. Interesting ending to the story. Some of the comments on here are so insensitivity written. Imagine Joe's wife is reading these and everyone's chipping in their criticism about how much of an awful person Joe supposedly was. Rather than pass judgement why not just be kind? No one dare make any passing remarks or responses to what I am about to write. 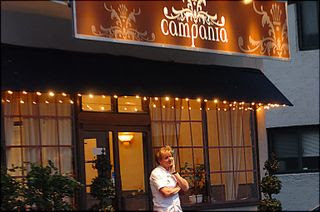 I dined at Campania several times under the owner who Joe bought the restaurant from. That man was a damn fine cook and anything he made was delicious. I was told that once the sale was finalized, the previous owner was convinced Joe wasn't going to last long. Needless to say, he was right.